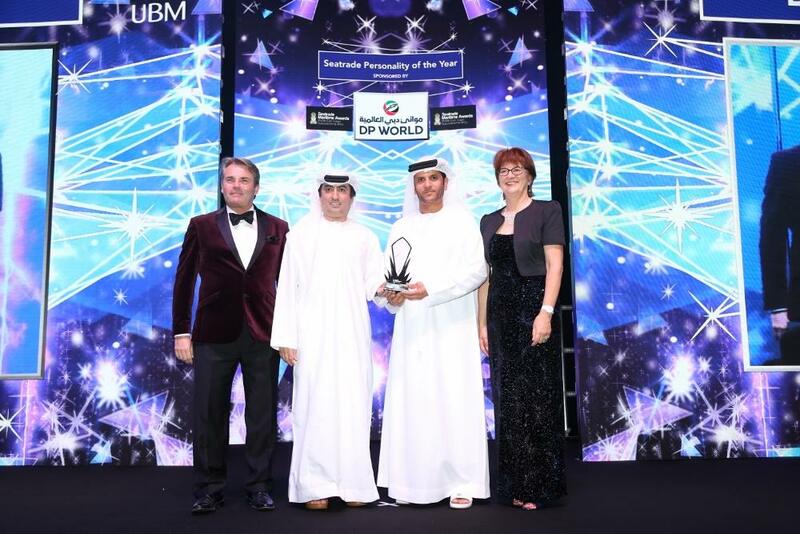 Seatrade Personality of the Year Award 2016, sponsored by DP World – UAE Region, was awarded to Dr Khaled Al Mazrouei, Chief Executive Officer, Abu Dhabi Ship Building. Presented by Mr Mohammed Ali Ahmed, Chief Operating Officer, DP World – UAE Region. Accompanied by Mr Andrew Williams, Group Managing Director, Seatrade and Mrs Vanessa Stephens, Managing Director, Seatrade Middle East. Dr Khaled Al Mazrouei, Chief Executive Officer, Abu Dhabi Ship Building (ADSB) was revealed as Seatrade Personality of the Year Award 2016 during the prestigious Seatrade Maritime Awards on Monday night (31st October 2016). Dr Mazrouei took centre stage during the evening which also saw Eng. Ibrahim Abdulrahman Al-Omar, Chief Executive Officer, Bahri win the Seatrade Outstanding Achievement Award 2016 and Seatrade Young Person of the Year Award 2016 awarded to Mr Paul Katsouris, Senior Associate – Head of Greece Desk, Fichte Legal Consultants. The Seatrade Lifetime Achievement Award 2016 was given to the Sharaf Group. The Seatrade Maritime Awards honour individuals, organisations and companies from across the shipping industry and are held under the patronage of His Excellency Sultan Ahmed bin Sulayem, Group Chairman and CEO of DP World and Chairman of Dubai Maritime City Authority (DMCA) and as part of Dubai Maritime Week. Attended by some of the most high profile and senior industry professionals in the shipping and maritime industry, the evening featured a surprise guest, former England international footballer and manager, Kevin Keegan, OBE, who entertained the audience with amusing football anecdotes. Also taking his share of the evening’s spotlight was prominent TV presenter, Nouraldin Al Yousuf, who acted as Emcee for the evening. Please find below the list of winners of the Seatrade Maritime Awards 2016. Offshore Marine Award for Owners & Operators: Halul Offshore Services Company W.L.L. Highly commended: International Ports Services Co. Ltd.
show organiser in the region, and the largest commercial organiser in China, India and Malaysia.